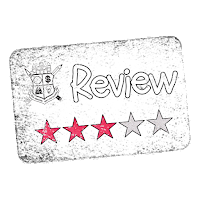 This week I decided to check out a rather cheap offering from a publisher that pops up a lot in my "feed" over at DriveThruRPG: Fishwife Games. .....but not so much this time. I really picked up on 50 Ships Of The Harbor, Volume 13 because it was cheap, at 75¢. I really didn't need a list of 50 ships for my own games, which I thought might be a bit more useful as far as an honest review goes. This is a small download at 600KB and only two pages. The first page is the cover and the second is a wall of text. The contents are clearly listed on the product page, so it shouldn't be surprised that the content is a bit on the light side, which is both good and bad. This product is basically just a list product, and at being the 13th volume I wouldn't be surprised if Fishwife Games just made a random ship generator and had it spit out 50 ships they could jam onto a page. If that was the case personally I'd rather pay a bit more an purchase the generator, but that is very much a personal preference and not a factor in this review. One thing I like is the simple fact that going into this purchase nobody should disappointed because you should know exactly what you are paying 75¢ for. List products like this are great for GMs that run a looser sandboxish game, like I prefer to do. I survive GMing a sandbox campaign by front-loading a lost of information in the form of lists. A lot of background info I keep fast and loose, referring to it as I need to. Then I'll make some notes on/in my lists and keep on keeping on. If my players were doing anything near the ocean I'd want a list of ships I could refer to if needed. 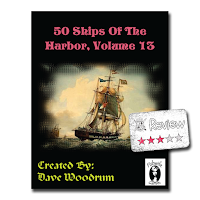 Personally I don't need a lot of info and for my game prep, 50 Ships Of The Harbor, Volume 13 gives me exactly the level of detail I need. The only problem I really have with this particular product is that cramming all the "product" to one page is too much. Instead of a tiny 8 point font I'd rather have a much larger font spread out over two pages. Realistically speaking, nobody is going to print the cover, so a three page PDF where I could print the content front & back onto one page would make a link product like this so much more useful. I'm not a big fan of the PDF being locked down with a password either, and while I'm reasonably sure the front page graphic is Public Domain, I'm not keen on the art not being credited. Lastly on something like this I'd like to see the PDF properties field being filled in. Minor points for most, but if I was to collect a series of these list products, like volumes 1-13, I'd want to delete the cover sheet and assemble them all into one PDF. Overall I like this product, but I think it needs some tweaking to make it useful for my game. The issues of too small a font and an inability to efficiently collect a series of these PDF is a bit much for my tastes. While a purchaser shouldn't be surprised at the content for this download, the lack of a preview means that some could easily be surprised not by the content, but by the layout/format.